Discussion in 'Cars in General' started by GTPNewsWire, Jan 29, 2019. This article was published by Andrew Evans (@Famine) on January 29th, 2019 in the Car Culture category. Brace yourselves... the wiener puns are coming. Also, if you're interested, the six license plates are: BIG BUN, OSCRMYR, WEENR, WNR MBLE, YUMMY and the all-time classic, OH I WISH. Inferno251 and TexRex like this. Doomotron, Inferno251, ferhound and 1 other person like this. Inferno251, ferhound and TexRex like this. Yeah who doesn't want to drive a Weiner. Got to be a right to drive it right? Because of my morning routine consisting of turning off my alarm and then checking the front page, guess which song was already stuck in my head by the time I was brushing my teeth? "If you’ve always wanted to grab your wiener with both hands and take it on an adventure across the United States, now’s your chance." Inferno251 and Famine like this. For nerdy information: a wiener is not a sandwich in Britain (obviously), just for information, and the other day I learned that Americans pronounce a "W" at the beginning instead of the "V". Very cool van though, it would make a great camper! They do periodic tables as well. ferhound and Famine like this. I want it on GT Sport, now. Inferno251 and ferhound like this. That's one hell of an introduction to an article. 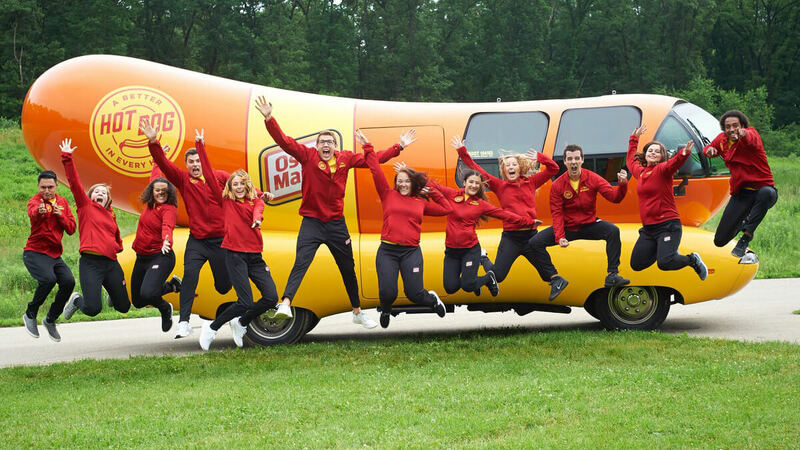 I'm surprised at the Weiner-Mini...and I'm sure there are plenty of jokes that could be made on that one. Huh. Oscar Mayer is such a ubiquitous brand over here, it's crazy to find out an unrelated food company with the same name exists on the other side of the pond. The reason it's so well-known here is because of their long history of commercials with arguably two of the most famous jingles in advertising history (or the two most famous here in the US, I guess). This is also the origin of the "OH I WISH" license plate, which I'm assuming you didn't understand at first. I love seemingly random things like this which break me out of my own cultural bubble. other day I learned that Americans pronounce a "W" at the beginning instead of the "V". Ha, yep. I assumed most Europeans knew this! Inferno251 and TenEightyOne like this. I've seen a couple of Bugatti Veyrons and two Ferrari 250 GTOs in my lifetime, but only one rolling hot dog (as opposed to hot dogs on rollers). I've been to Canada 10 times and still do double-takes at Purolator Couriers, as opposed to the semi-related US automotive filter manufacturer.